1365 – Documents record the game of soule as an ordinance of Charles V "that the solles cannot appear among the games which serve the exercise of the body." Moreover, it does not appear that the Breton sovereigns (Brittany being independent at the time) continued the game, as it was not under the same ecclesiastical authority. To see the usual practice to day in Normandy since 2001 go to see jeuxtradinormandie.fr, facebook federation des jeux et sports Normands. Championship since 2011 with 6 teams. A Normandy festival is held in Jersey, Guernesey ou Normandy every year, normally involving some re-enactment of choule. Since 2003, the villages around Vendôme (between Le Mans and Blois) have been playing the game annually in early September. The French recognise[weasel words] similarities between la soule and the game of Royal Shrovetide Football as played in Ashbourne, Derbyshire. An open invitation was extended by the Vendômois French in order to increase numbers and popularity and players from the Bulldogs Rugby Club, Twickenham, UK, have taken part since 2008. La soule at Vendôme typically takes place in a flooded woodland area with two teams each of around 40 players chosen at random using a pack of playing cards, i.e. red or black team. The "ball" is a heavy pyramid-shaped leather sack stuffed with straw which becomes extremely heavy when wet and difficult to handle. Goals are designated by painting a single tree red at either end of the pitch and a goal is scored by touching the opponents' tree with the ball by whichever means possible. There is no referee or timekeeper and although there are few rules, good sportsmanship is encouraged. The game ends by mutual consent once a side is deemed too far ahead on goals to be caught; games usually lasting 2–3 hours. Royal Shrovetide Football heraldic similarity - three cockerels. ^ a b c Jusserand, Jean-Jules (1901). "Chapitre VI: Paume, soule, crosse et leurs dérivés". Le sport et les jeux d'exercice dans l'ancienne France (in French). Archived from the original on 7 February 2008. Retrieved 12 July 2016 – via L'Encylopedie de L'Agora (and the Internet Archive). Full text available via Project Gutenberg. 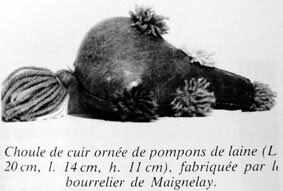 ^ "Fédération des Jeux et Sports Traditionnels Normands et Vikings (choule…)".